Three Point Estimate (Part 2): An estimate by definition is a guess, albeit an educated one. If estimates had to be always accurate, then they wouldn’t be called estimates. Every task involves an element of uncertainty or risk. A good estimate incorporates the uncertainty or risk involved in the task. This article is a prelude to a series on project estimation using PERT. The basis of PERT is three point estimate, which we’ll review here. 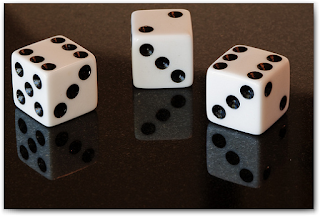 According to Wikipedia, Probability is the measure of the likelihood that an event will occur. Let’s start with an example. Say you have developed a computer program that guesses a person’s age based upon his/her first name. Behind the scene, the program is so crude that all it does is to randomly pick a number between 1 to 100 and spits it out. Assume that I’m a user of your program. What’s the probability that your program will guess my age correctly? Since the draw is completely random and total number of outcomes is one hundred, the probability of the computer picking any number is one in hundred (1/100 or 0.01) or simply 1%. So, the probability of your program to guess my age correctly is only 1%. Obviously you don’t score a lot of points with your friends when you demonstrate this program to them. It seldom guesses anyone’s age correctly. After a bit of humiliation, you decide to overhaul the program and build in more intelligence. You modify the program such that instead of giving a single number, it gives the age in a range of ten. Instead of saying, “Your age is 27 years”, it now says “Your age is between 21 and 30 years”. With this modification, what have you done? You have made a 10-fold increase in the accuracy of your program. Now the program has a one in ten chance, which is 10/100 or 0.1 or 10% probability of guessing a person’s age (or the range) correctly. What did you learn here? When making an estimate (or a guess), it better to estimate in a range, instead of a single value. By doing that you have a better chance to be correct. Good estimates are in a range. Let’s switch back to Project Management now. As I said in the beginning, an estimate by definition is a guess. Assume that I’m a project manager and you are one of my team members. I ask you to give me an estimate for an activity, which you are not very familiar with. You think you can complete the activity in 8 days, but you are not quite sure. In order to save your back, you ‘pad’ another 8 days to the estimate, and give me an estimate of 16 days. Do you know that you just violated the PMI Code of Ethics and Professional Conduct. What? How? Padding is inherently evil, to the extent of being unethical. Yes, unethical. It not just results in overestimation and increased project costs, it also pollutes the historical data, which is used on future projects. Trivia: Do you know the difference between a pad and a reserve? Three point estimate concept originated with PERT. PERT uses three estimates - Optimistic, Most Likely, and Pessimistic - to define an approximate range for an activity’s duration. Back to our previous example, why should we do something unethical when there’s an easier and ethical alternative. Instead of you telling me that the activity would take 16 days to complete, why don’t you be transparent and tell me the truth? You could say that this activity would take 8 days, but you are not 100% sure. In the worst case, this activity might even take 16 days. Whereas, if things work out really well, you might be able to complete it in 6 days too. So, your best case estimate is 6 days, most likely estimate is 8 days, and worst case estimate is 16 days. Instead of giving me a fixed estimate, you have given me 3 estimates (or Three Point Estimate) or a range. The range demonstrates uncertainty or risk involved in an activity or a project. The larger the range, the more the risk. By looking at the range, we can get a sense of uncertainty or risk in a task. High uncertainty in an activity warrants risk evaluation and appropriate response to reduce the risk. A single point estimate gives too much opportunity for a person to pad the estimate. Padding the estimates is unethical. In order to get a sense of uncertainty or risk in the estimate, it's best to estimate in a range. By estimating in a range, we are able to get a more realistic estimate. Now we have laid the foundation for our next article, in which we’ll learn more about PERT. Please feel free to post your questions, comments or suggestions. Harry... Its been a long time i visited your blogs.. So, you mean higher the range, more the uncertainity/risk and more accurate the result(as the risk evaluation and risk response will be involved). your explanations and style are very effective. The references to statistics are like condensed form of wisdom that we find in complete graduation in statistics. Really appreciate.